Kvarkadabra blog: OECD: Neenakost v svetu se povečuje. Kako ukrepati? OECD: Neenakost v svetu se povečuje. Kako ukrepati? OECD je pravkar objavil poročilo, v katerem analizira povečevanje neenakosti v svetu in predlaga vladam ukrepe. Over the two decades to the onset of the global economic crisis, real disposable household incomes increased in all OECD countries, by 1.7% a year, on average. In a large majority of OECD countries, household incomes of the top 10% grew faster than those of the poorest 10%, leading to widening income inequality. Differences in the pace of income growth across household groups were particularly pronounced in some of the English-speaking countries, some of the Nordic countries and Israel. 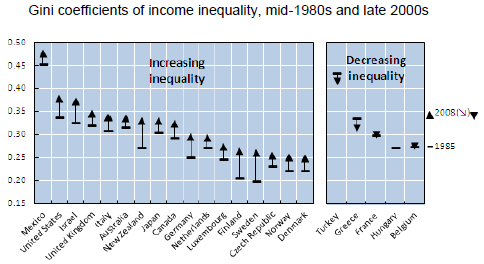 In Israel and Japan, real incomes of people at the bottom of the income ladder actually have fallen since the mid-1980s. With very few exceptions (France, Japan and Spain), wages of the 10% best-paid workers have risen relative to those of the 10% least-paid workers. Self-employment is another factor that could play a role. It is much more unequally distributed across countries than wages and salaries and the self-employed tend to be disproportionally concentrated in the lower income groups in most OECD countries. A key challenge for policy is to facilitate and encourage access to employment for under-represented groups. This requires not only new jobs, but jobs that enable people to avoid and escape poverty. Recent trends towards higher rates of in-work poverty indicate that job quality has become a concern for a growing number of workers. Policy reforms that tackle inequalities in the labour market, such as those between standard and non-standard forms of employment, are needed to reduce income inequality.